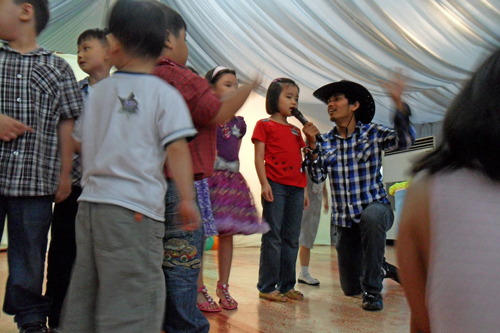 Classic entertainment for kids and kids-at-heart! 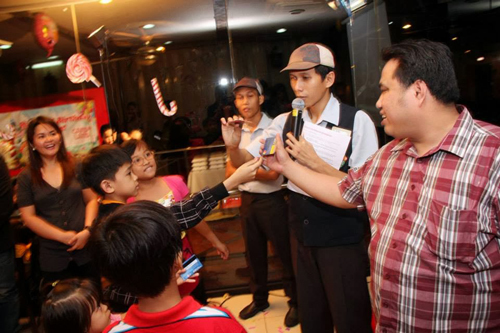 (SPOT.ph) Before photo booths, Marvel hero mascots, and bubble shows became trendy, kids kept themselves entertained at birthday parties with good old parlor games. While you probably don't have fond memories of the Pennywise the Clown lookalike at your sixth birthday party, you're sure to have had at least one happy thought about that shiny toy you snatched from the pabitin. 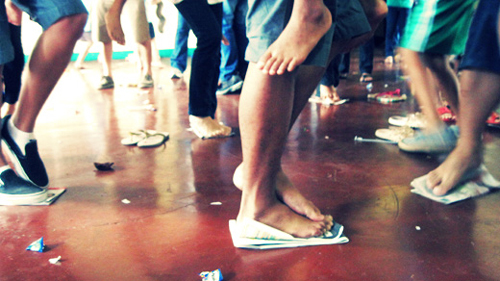 Which of your classic Filipino party games made it to this list? Take a walk down memory lane to remember how competitive you probably were as a kid, or to simply recall the good times. 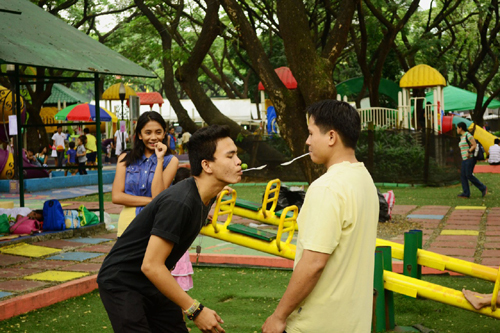 Check out this list of funFilipino party games. We never did find out why this game is called Trip to Jerusalem (they say the name originated from Germany), but it's a certified staple at every kiddie party. Children go round and round a bunch of chairs while music plays in the background. 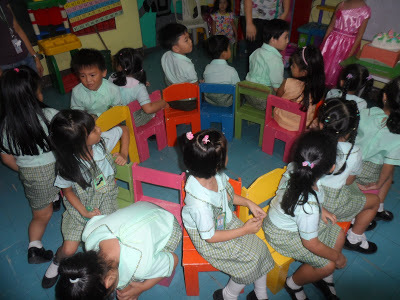 When the music stops, each kid must sit on a chair. There is always one less chair than the number of children, so whoever doesn't have a seat is sadly eliminated. 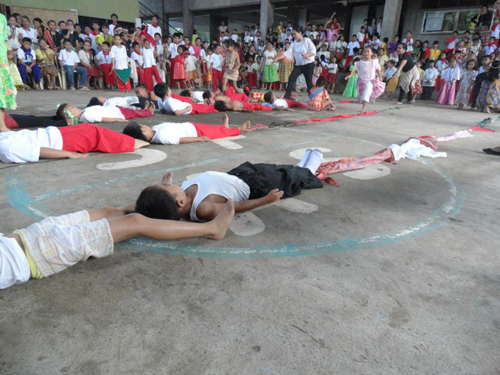 Hampas Palayok is to Filipinos what Hit the Piñata is to Mexicans. 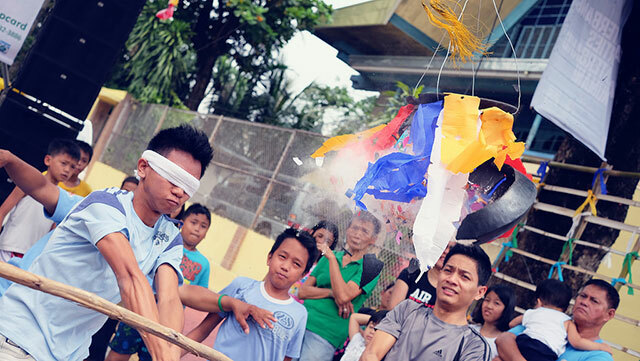 Each child is blindfolded, given a bat, and led to a hanging palayok chock full of goodies like lollipops and chocolate coins. The truth is, no one wants to be that poor kid who hits the palayok. While the palayok breaker struggles to remove the blindfold, the rest of the kids swoop in to claim the bounty. The rule is simple: Bring whatever the host asks for the fastest and you win a prize. This game is as much a trial for the adults as it is for the kids. Who can forget fighting over who gets to pluck lola's uban for "Bring me...a white hair!" or raiding your mother's coin purse for a five-centavo coin? You find out who the future strategists are with this fun group game that uses a lot of creativity. Kids and parents are formed into groups and tasked to make the longest line possible using everything at their disposal. This includes themselves, clothes, accessories, and more. Some popular items: dad's sinturon and kuya's shoelaces. The point of this game is to be a part of the last group standing. "The boat is sinking. Group yourselves into [insert number here]," the host calls out. The kids hurry to form groups with the right number. Anyone left without a group is eliminated. It's good practice for building alliances (except it's all in good fun and there's no actual politics involved). This game involves a wooden lattice tied with various goodie bags suspended in midair and lowered up and down to a waiting crowd. The kids jump as high as they can to grab the goodies. No other game earns more frustration than the pabitin-or at least, that's the case for kids lacking in the height department. Also known as Stop Dance, this game involves pairs dancing on a piece of newspaper, folding the paper in half in each round until it becomes smaller and smaller. When the music stops, both members of the pair must successfully stay on the newspaper without any of their body parts touching the ground. Key points to winning the game: twisting, lifting, and lying ("My foot is small and delicate enough to fit this tiny paper square!"). Limbo Rock is the ultimate test of flexibility. 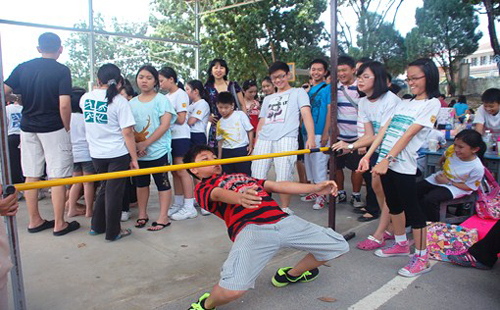 Kids must pass under the limbo stick without touching it or touching the ground. It's an easy feat in the first round, but casualties usually pile up with each round as the stick goes lower. That doesn't mean the most flexible kid automatically wins, though. If you've ever bent the rules and pled your innocence by bawling to get to the next round, you know what we're talking about. This game is an exercise in vocal calisthenics (a.k.a. the perfect excuse for kids with excess energy to put their lung power to good use). Kids are tasked to say "Happy Birthday" and draw out the last syllable until they run out of breath. 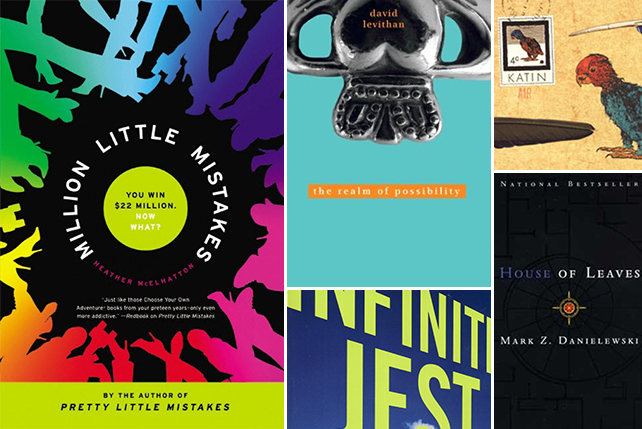 Whoever holds out the longest and manages not to keel over wins. If there ever was a game about patience, it's the calamansi relay. 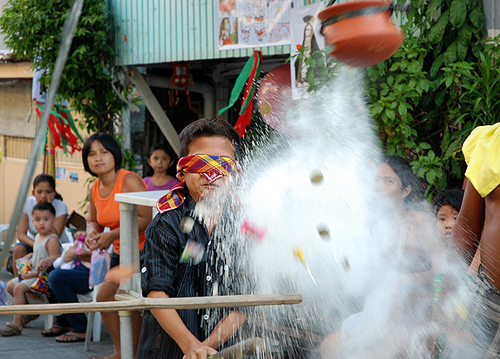 To win, each member of the group must put a spoon with a calamansi in his or her mouth and race around a designated spot. Frustration mounts whenever a calamansi falls because the group member has to start over. The first group with all members finishing wins. Variations include the egg relay (often skipped because cleaning up egg bits and egg shells is not fun) and the more adventurous eggplant relay (the adults definitely love this one).